As you know I have a major thing for sweets and chocolate but lately my intake of my favorite food group has been drastically curtailed by strict doctor’s orders. A visit to my favorite chocolate shop Vannier and top patisserie Gerard Mulot are mandatory stops on my Marais tours and clients generously offer to buy me chocolate and a pastry. Not wanting to insult them by refusing, I always happily indulge them. This was great until January, when I found out my sugar count was off the Richter scale and my doctor said no more sugar for you for a while buddy, or else you will be a diabetic in two years. Ouch, that put a dent in my sweet tooth. My craving for sweets has only increased since my doctor’s decreed and finding new places for them still piques my curiosity. I recently discovered a sweet little sweet shop right across the street from me, Exceptions Gourmands, on the charming place St. Catherine. The tiny shop specializes in only a few things, but boy do they get them right. A new line of sophisticated nut spreads inspired by Nutella is made with cashews, almond, hazelnuts and exotic black sesame seeds. 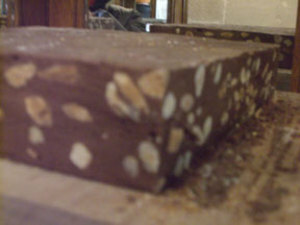 Big slabs of traditional nougat candy in chocolate and Montelimar white are hand cut to your specifications, although if I could, I would buy the whole slab. 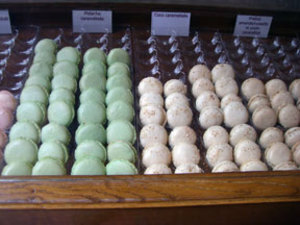 Macarons were excellent and the caramel flavor was exceptional. (I had a few TINY samples. Please don’t squeal on me to my doctor). Wood skewers with marshmallows covered in toasted coconut looked awfully yummy and summer promises a line of homemade gelato. White washed stone walls, a clever ceiling fixture of a steel pot with lights growing out of it, and brick colored hexagonal floor tiles make a perfect backdrop to show off the simply packaged products. Florence, a smiley and cheerful salesperson, explained to me all about the different creations which made it even harder to resist having a taste of each. 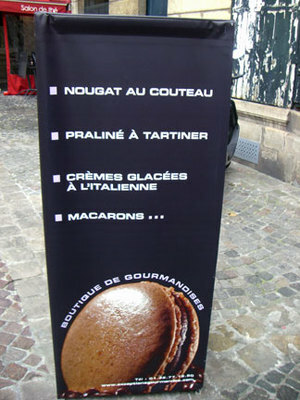 Luckily or maybe unluckily, I narrowly escaped with only a taste of the macarons. 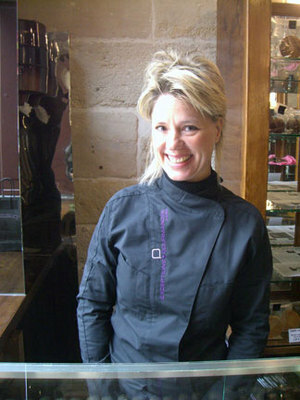 Note:I want to thank my friend and fellow Paris blogger Kim Poulin, for writing such a glowing and thoughtful review of my tours and blog last week on The Paris Traveler. I was a borderline diabetic until I found cinnamon. Just a teaspoon or so each day will drastically lower your sugar count. I put it in our coffee and I eat it on toast each morning. Try it. You're not alone in being excited about this place, and I'm heading there as soon as my plane lands next month.